an e-mail address where the user would like to receive updates and messages from the site. 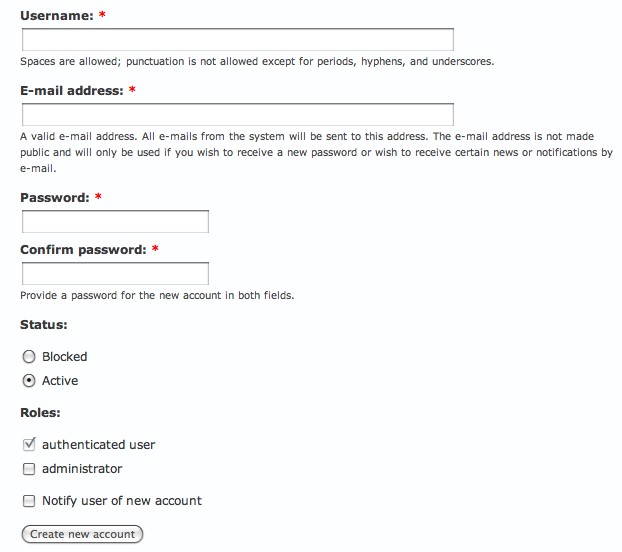 Log in to your UDrupal site as an administrator or into another account that permits you to add new users. In the Username text box, type the user's EmplID or StudentID. In the E-mail address text box, type the requested e-mail address. If you would like to have e-mail sent to the user informing him or her of the new account on your site, select the checkbox next to Notify user of new account. Locate the new account you just created. The Username will be displayed as the EmplID or StudentID. Click edit for the new account. In the Display Name box, type the user's UDelNetID or StudentID.